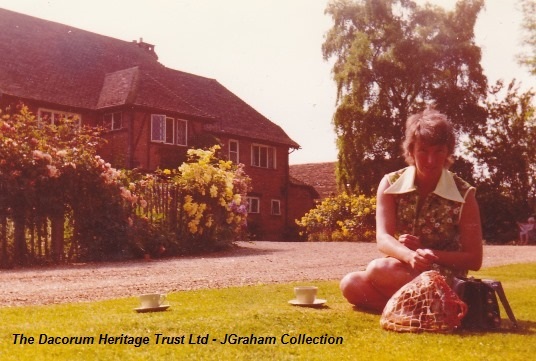 Saving the 70s- Joan Graham | The Dacorum Heritage Trust Ltd.
We interviewed Mrs Joan Graham in the summer of 2014. Throughout the 1970s Joan was a teacher at Kings Langley Senior School and the captain of the Kings Langley Village Netball team. 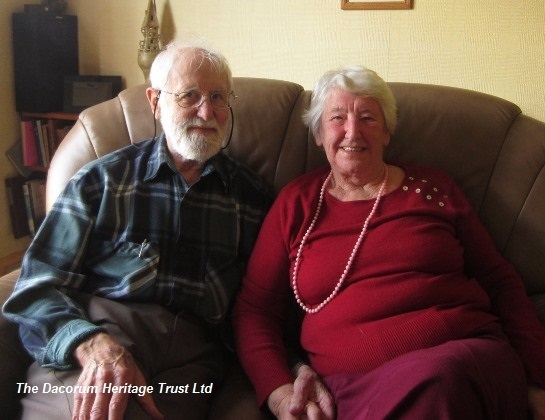 Here are a few clips, which we hope spark some of your own memories. Transcript: When I went back in the 70s I taught maths, English, history I didn’t teach any girls PE cause they had a new PE teacher in by then. Math, English and Health education yes. Well I had darker hair then not white, just last week we went to a WEA and one of the women oh she must have been in her 60s said hello Mrs Graham and I though oh yes and she said you used to teach me. Yeah the pupils. Yeah. My neighbours are pupils, were pupils as well so they have to behave themselves you see. When the school was built in 1960 it was built for the three villages and that was Bovingdon, Chipperfield and Kings Langley and that was all we took and I always use to know who came from Bovingdon because their tables were very good. So somebody in primary school in Bovingdon Primary School was very good at tables and they were very good the kids that came. I used to say I’ve got some from Bovingdon you know. The terrible is I was part time you see then, in the 1970s, so I was moved all over the place so you could teach sort of in, you know, your maths in one classroom two periods and then you’d have to run across cause the kids didn’t move the teachers moved. The kids stayed in the classroom. Yeah. I said as long as there was a black. Oh there was blackboard and chalk in those days not white boards like there are now aren’t they?. Blackboard and chalk and rubbers yeah yeah. I remember parents nights I used to say oh yes your child is, you know, not as good in maths as you were. Sort of thing. So I used to teach two, there was two generations eventually, three generations now. Transcript: Was that the day of the mini dresses? Yes I had mini dresses yes, (what colour was it?) white that one yeah. No white dress mini dress yes that was a posh one, for a occasions that one. At school? oh skirts and blouses mainly. Transcript: Yes the first teacher governor in the 70s and it was me. I was the first parent’s governor that was in the 70s I can’t remember when but that was in the (first years of the 70s). While I was on parish council I was also the governor of the primary school, presented the prizes on sports day. Transcript: Kings Langley Village Netball team the girls I think it was the Hemel league I think it was called all our tournaments were at Hemel. We had to practise at the Steiner School cause they were the only ones with a netball court and they’re still in the village, the netball, some of the netball people. It was very much a scratch team people who were willing to play really. It must have been a good netball team cause they all got pregnant. no (they were) just looking for matches and playing (it was for that realise) no it was just exercise on a Saturday for people who had lots of children could escape. Yes they had to be Kings Langley residents yes. Yeah it was fun yeah. And It was nice to have people come and say I can shoot you know so alright you be the shooter or help shooting you know whatever it was great and I think we played in a tournament at Cavendish school in Hemel Hempstead and erm all the dads turned up with their pushchairs and pram, you know, to watch us. We were very pleased when we got matches we had as I say lots of practises when we could get away from husbands and children, we were all so very pleased when had matches with people yes. (Joan’s husband- they made her captain cause she was the only one with a whistle) yes that’s true yes they made me captain cause I was the only one with a whistle. One of the netball team got together and made the skirts, 7 skirts yeah that’s right. They were green weren’t they white shirts and green skirts yeah. Transcript: There weren’t many cars in those days when I first started there was one car in the car park and that was the headmaster and then gradually, slowly there got more cars, but certainly no sixth form cars no sixth formers were allowed to drive. Well there wasn’t a sixth form was there in those days the sixth form started later than that. oh yes I had a van to start with a little Aston 7 van that’s all I could afford cause he had the car erm and then I had Morris 8 black and then I had a triumph I always fancied a triumph you know. Oh it was a Morris Mariana not a Morris 8 yeah. As I said there was one car and that was the headmaster’s and then gradually there was more cars but no certainly, well half a dozen or so for the teachers and that was it. Transcript: I think yes they had detention I think they did I didn’t have any trouble with the discipline it sounds big headed doesn’t it but I didn’t though I think It was because I had the lower classes and they were alright you know. The difficult ones send to Mrs Graham yes. Yeah I think they were just sent to the headmasters and you were told off or whatever it was then but they got detention cause detention was in the history room on a Thursday after school. 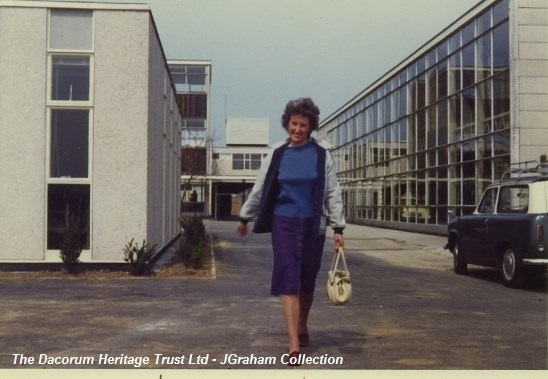 Joan Graham, teacher at Kings Langley Senior School. 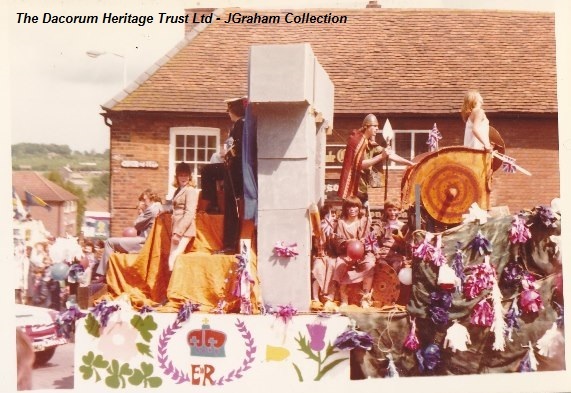 Parade along the Kings Langley High Street for the 1997 Silver Jubilee. Joan dressed in a classic 1970s floral dress.